Just received my Vantage Vue in the mail this week and now have it installed in the backyard on a mast up about 20 feet. Works great and am delighted that the readings it produces match the local weather reports (so the wife asks "Then why did you need to buy this expensive "toy", if you can get the reports free?"). Good question, but she doesn't understand what makes weathermen (and weathergirls) tick. Yes, it's expensive, but I believe nothing is 'overpriced' if the company makes money selling it. I'm all for American ingenuity and enterprise (which must be motivated partly by profits, else we wouldn't have jobs). Having said that, I didn't buy the data logger because I did feel it was a bit over-featured for what I need. I'm also an amateur radio operator and am accustomed to tinkering and building my own circuits. So I was wondering if anyone has figured out the pinouts on that 20-pin connector on the bottom of the console. All I need are the serial outputs so that I can capture and archive the readings. I will also forward them to my APRS (Amateur Position Reporting System) equipment, which currently consists of a Kenwood TH-D72A VHF handie-talkie, with built-in GPS/TNC/digipeater. This will put my weather reports on the amateur radio RF networks, which indirectly link into to several Internet gateways. Yes, I know there's some additional memory and logging functionality in the Davis product, but I plan to archive my streaming data, so I don't think I need all the bells and whistles in the WeatherLink logger. Is anyone in this group familiar with these interfacing issues? In that thread there is a link to a very resourceful member's site, where he has mapped the pinout. If you've already seen that page, then I'm afraid that I can't be of any further help to you on this. Please keep us advised on how it goes. Ah, I completely missed reading that link. Exactly the kind of info I'm looking for! I'll report back any success (or failure) here. First, I need to learn a bit more about running the Vue, my very first weather station (just an amateur at weather too). Hi John. That resourceful member would be me. Your timing is very good. I just had a guy report a successful hookup to a Vue using my DIY method. I helped him troubleshoot a problem he was having, and he's reported back that his Vue is working perfectly with the WeatherView32 software. Not only that, but he was able to flash a firmware update to the Vue without the logger as well. How cool is that??? See the comments to the blog post linked above for all the details. I've pasted in his final setup below. Looks like he ordered from an ebay seller out of Hong Kong and got his converter for $15. You could get it from the Sparkfun link in my blog for the same price, and get it a lot quicker (assuming you are in the US). He's out of the Ukraine, so that route made more sense to him. Note the terminal program he used: whatever it was he started out with didn't work right. > Hi John. That resourceful member would be me. > Your timing is very good. Good work, DeKay, and, yes, the timing is perfect! Your solution is very simple and provides the serial access I am looking for. I will order the FTDI part and give it a try. After conferring with DeKay (who should be recognized as the 'pioneer' here) I have come up with an idea for building an inexpensive (i.e. < $100) wireless interface between the Davis Vantage Vue console and a USB-equipped computer within a hundred feet or so. I'll plug one of these XBees into the console and the other one on the computer, using the $15 USB-COM to complete the connection to the computer. Then, with a little software glue that I'll write, we should be able to interface to the host of weather software that's normally accessed via WeatherLink. There's a few other parts needed: 20-pin connector, small pcb boards, and some wiring to power the interface from the console and the computer. I've got some parts on order already and will design this thing as I go. Hopefully won't be more than $100 out of my pocket. (But this is my first weather station, which I've only had for a few days, so I expect there will be a learning curve as I proceed. So be patient while I work out the kinks here). BTW, I'm not trying to compete with Davis here, whom I admire greatly for the quality of their product line. Rather I see it as filling a 'missing link', a simple serial interface for those folks who don't need a full-featured data logger interface. Who knows, maybe this will inspire Davis to add a similar product to their existing offerings (before someone else does). ... I forgot to mention the 'motivation' for wanting to build this wireless interface. I currently have the Davis console in our kitchen area, where the whole family can see and use the weather station. But I also want to send the reports, automatically, to the amateur APRS network, from my ham station upstairs. I just thought I'd clarify what John/af4ex is on to here. Two $20 wireless modules, one $15 USB-COM adapter, a bit of wire, and some willingness to get your hands dirty, and you've got a wireless link between your console and your PC. For any purpose you want. There are threads like this asking about how to extend the range between the logger and a PC. Well, this is really a great way to do it, and you don't even need a logger in the first place! af4ex mentions some software that he needs to write, but I'm not sure what that would be for a general application. He'll need a bit of custom software for his specific application, sure. But others have reported that other software written to interface to the logger works just fine with the USB-COM adapter method. It should just work. Once configured the XBee modules should give you a transparent serial link between the console and the PC. I think. But af4ex has got the parts on order, so we'll know soon enough. And like John/af4ex, I think Davis has a great product in the ISS and the console. I admire the quality of the product and their willingness to disseminate technical information. It has helped me a great deal. Their interfaces, though, aren't so great. I'd humbly suggest that they unbundle the software from the interface and drop the price to something a little more reasonable. Or build something in to the next rev of the console. This stuff isn't hard to do. > would be for a general application. I'm a complete 'weather newbie' here, with respect to operating the weather station and associated software. So it will be a (fun) learning curve for me to figure out what has to be done. Ideally I won't have to write any additional software 'glue', if the XBee wireless serial port performs 'transparently' as advertised. But I've never used these XBee's before, and am used to situations where the hardware interface creates issues (wrong format or ordering etc) which have to be fixed 'in software'. If everything goes according to plan, this will be a fairly simple pair of gadgets that you plug in. One of them (a homemade XBee dongle) will plug into the Davis serial port on the bottom of the console. The other (ready-made Xbee dongle from SparkFun) will just plug into a USB port on your computer. They'll need to be configured for initial use, but beyond that it should work just like a regular serial port. Still working out the details on that 'homemade' dongle (Which uses a nonstandard connector). While we are throwing around ideas, you could hook up an XBee directly to an appropriate wireless router with a compatible serial port, like this hack on a WRT-54G, or this port on an Asus RT-16. These routers could serve a web page with weather data or push your APRS data. The Asus router in particular is insane: 128 Meg of RAM, 32 Meg of Flash, 480 MHz processor, 2 USB ports, Wireless B/G/N. All this at only 8 Watts of power consumption, and I can buy one new for $90. The USB port would give you the capability to archive your data to an external USB drive or thumb drive. This would give you some impressive capabilities without having to run a PC all the time. It would be a fun project for someone who wanted to write a little software. Free software projects like weewx or wview give you a heck of a head start as well. This would be the ultimate setup in my opinion (after writing a little more software and adding a few extra remote XBees to support home automation and monitoring features, of course). Phase I of the "homemade" Vantage Vue serial adapter is complete and was successful. The goal was to duplicate DeKay's initial groundbreaking results and to assess the feasibility of a wired serial to USB interface, using the VUE expansion port on the bottom of console, i.e. eliminate the need for WeatherLink for those folks (like me) seeking only a simple serial connection to the console. In Phase II we will assess the feasibility of an XBee-powered wireless serial interface to extend the effective distance, so that the console and the computer can be in different places in the house. Depending on the outcome of Phase II, Phase III might include the fabrication of a DIY "wireless dongle" board/kit, to make the interface available to the everyone. Yes, the socket is supposed to be used for the XBee's, but it also happens to match the 2mm pitch for the console port, which is rather inaccessible. Using a small file as a blade, I sawed the socket into two smaller 1x2 sections for plugging into the power and data pins on the expansion port. 1) Before and after shots showing the original 1x10 socket strip and smaller sections hacked apart with file. 2) Showing the finished console connector, with white heat-shrink tubing applied to keep the metal parts from touching. 3) Soldering jig for the console connector, before applying heat-shrink tubing. 6) Interface cable attached to console, getting ready to plug into FTDI adapter. 1. This cable is obviously not a finished 'product' but just a piece of test-gear to help me figure out the finished designs. But it is robust enough to leave in place semi-permanently, if you're not planning on moving the console box around a lot. 2. To build a cable like this requires some experience with soldering and circuit construction. Wait for the 'dongle board' if you're novice at this (but that might not be ready for a while). 3. You MUST use the shrink-wrap or the wires will definitely touch and short out everything. 4. Be careful probing around the pins with voltmeter. The 3-volt Vcc and Gnd pins are right next to each other and a slip of the probe could prove disastrous. 5. Using DeKay's pinout diagram for navigation, one of the connectors (blue and green) hooks the USB Rx/Tx to the console Tx0,Rx0 pins. The other connector (red and black) hooks up to the gnd pin (leaving the red wire available for XBee connection later). So the connectors end up at right angle to each other. (Good thing the rows are also separated by 2mm, like the individual pins). Should be getting my XBee chips and USB dongle tomorrow, so I can start on Phase II of this project. Thanks again to DeKay, whose "pioneering" efforts, produced the interface knowledge needed to build the cable. My XBee chips and parts arrived, so now I can begin Phase II, the _wireless_ homebrew serial interface. The XBees should theoretically "just work" once they are properly configured. How do you intend to power the one on the console? Keep the console plugged in to the AC adapter and leech off of it via Pin 18? That seems to be the cleanest and simplest way. Or is there a clever way to sleep the console XBee to conserve power without missing any data? One thing I haven't bothered looking in to yet is seeing how much data if any the console buffers. So if you were to poll the console every, say, 5 minutes, would you get all of the data over that period or just that from the last set of readings? One thing I haven't bothered looking in to yet is seeing how much data if any the console buffers. I don't think there is any LOOP buffering. > The XBees should theoretically "just work" once they are properly configured. Hopefully that will be true. Minor complication, I have eye surgery this morning so will have to give the WX stuff a rest for a day or two. Then onward with Phase II! Thank you DeKay!! I also have success using your discovery. I have my vue up and running on VWS with this setup. Works great!!! You're welcome! And thanks for passing along that VWS works on this interface. It seems that every piece of software thrown at this solution so far is working. Still hoping to hear from someone that tries the software that comes with the actual logger. I'm back from the eye surgery (cataract removal), which went very well. The eye is still a bit itchy, but that shouldn't stop me from working on the wireless interface. I've already configured my two XBee modems for 19200 baud service and have started to layout the proto-board for the Davis box connection. (Nothing to do for the remote computer side connection. Just buy the SparkFun XBee Explorer and plug it into a USB port). On the Davis side, this looks like it will be a very simple interface, because the XBee and the Davis boxes already operate at 3.3v. Just a few wires to hookup and it should work transparently as a serial port. Might take another day or two to finish up the Phase II project and write it up. Davis should consider (although they won't) selling just the dongle users can hook up a console to their computer. A lot of people don't use the Weatherlink software "bundled" with the hardware, anyway, and (we) end up stuck paying big $.$$ just to access the data on a PC/MAC. I started out with a USB weatherlink and then "upgraded" to the WLIP "logger". Needless to say they both shipped with the exact same software CD, which of course I no longer have the need for. You guys have proved there is an alternative, at least for those who don't mind getting their hands dirty! That really isn't true. The WeatherLink software has the ability to check reception diagnostics, change numerous configuration settings, and plot reception percentages versus time. No other third-party software can do all this. So if you are having problems with your system, the WL software is indispensable. Of course, you may not need multiple copies of the software though after buying several loggers. Very good points, d__l, thanks for the reminder concerning the pluses. My point was using WL strictly for reporting purposes. Give these guys here a little more time digging around, and who knows what they'll be able to find! The Weatherlink software has the ability to display reception diagnostics. but the same information can be displayed right on the console (on a VP2 anyway). Look for "Console Diagnostics Mode" just before Appendix A of the manual and give it a try if you haven't before. I was impressed that Davis went to the effort to put a cool feature like this in, but I guess it helps them too in diagnosing problems. Try it if you haven't before - it won't hurt anything. I geeked out when I gave it a try. Also, any configuration setting in the software would also be accessible through the datalogger / DIY serial interface that Davis has documented very thoroughly. Good news: I've got the Phase II XBee wireless interface working! It's streaming data to APRS/CWOP as I write this note. The VUE console is downstairs in the family room beaming data to my laptop in the hamshack upstairs. Everything seems to be working flawlessly. I'll post a writeup this evening with pictures and notes on how this Phase II prototype was constructed. Also got my NWS ID (AU006) and have been transmitting data to APRS/CWOP continuously since 1-Mar-2011. (Went down for about an hour today while installing the XBee interface, which replaces the wired USB-COM interface). 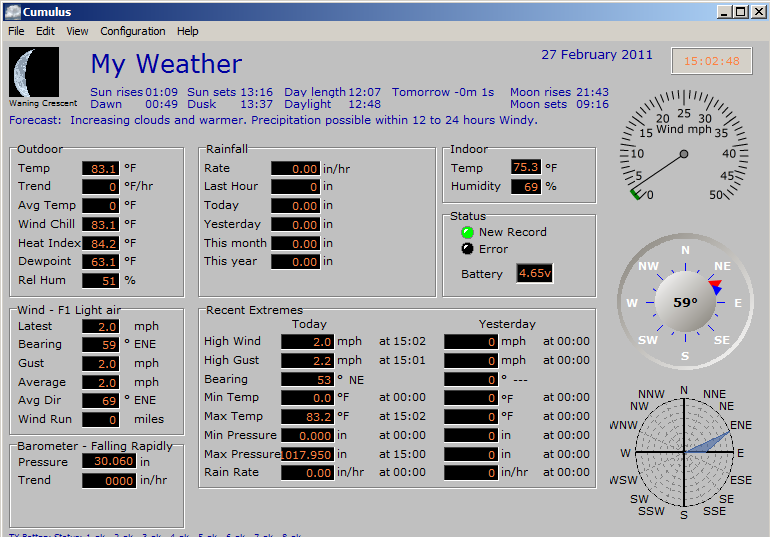 Proving that you don't need a WeatherLink to run a VUE weather station over the Internet!